Paco Díaz (Palma de Mallorca, Spain) on 13 October 2008 in Cityscape & Urban. Excellent. I love the look of the metal. The paint glows. The era when cars were a work of art, albeit an environmental disaster. This reminds me of Cuba where they have a lot cars from the 50's, a golden age for automobiles now seem like dinoseaurs. 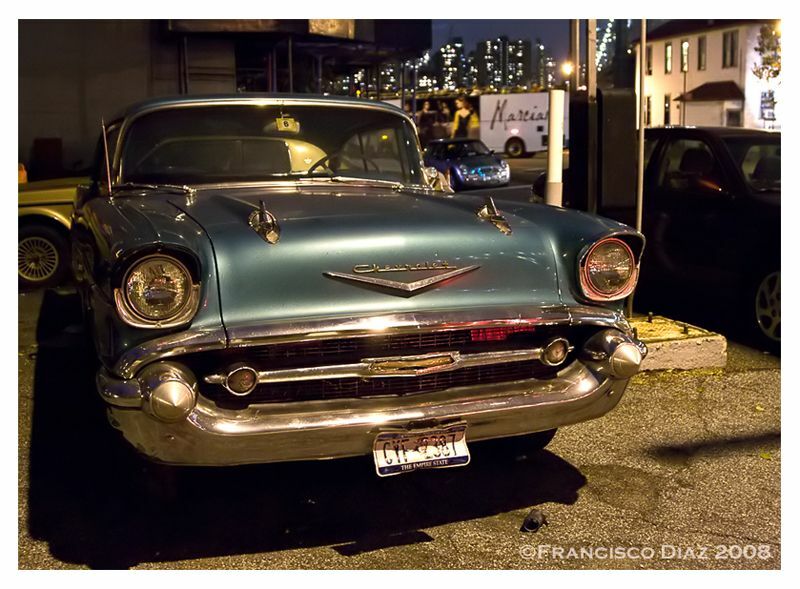 Ah, the '57 Chevy - one of my all-time favorites - nicely done, Paco. a beautiful vehicle! very handsome and easy on the eye! i love the design of the 50's... brassy!! Wow this a great take on the classic chevy. Looks like a face staring back! jolie voiture mais surtout bel éclairage. Y a t il eu un post traitement? @Laurent: Oui, Laurent, j'ai ajusté les niveaux et appliqué très peu de Neat. Seulement. C'est la 40D qui a tout fait. Y que lo digas. Ya me gustaria a mi tener uno de estos viejos cacharros. Me gusta mucho el color que les has dado.